Why is Israel considered the cornerstone sign of end time Bible prophecy? Dr. David Reagan and I recently had the pleasure of asking this question of August Rosado on the show Christ in Prophecy. August is a Bible prophecy teacher and preacher and founder of a ministry called Today in Bible Prophecy. Having a passion for all things Jewish, he can be found traveling the country waking the Church up concerning the soon return of Jesus Christ. 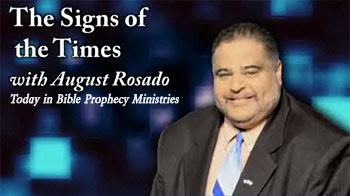 August Rosado: The Bible teaches that the greatest miracle of the 21st Century was the rebirth of the State of Israel on May the 14th of 1948. As a matter of fact, God told the Jewish prophet Ezekiel in Ezekiel 36:24, "For I will take you from among the heathen and gather you out of all countries and will bring you back into your own homeland." Again, that was fulfilled on May the 14th of 1948. Can you imagine that? God revealed that to the Jewish prophet Ezekiel some 2,600 years ago, foretelling that the Jewish people would be back in their own homeland. God also told the Jewish prophet Amos in Amos 9:15, "'For I will plant them upon their own homeland and they will be no more uprooted out of the land which I have given them,' sayeth the Lord." This is the reason why the Arab world was unsuccessful in trying to eliminate the Jewish state of Israel during the War of Independence in 1948, the 1956 Suez Canal War, the 1967 Six Day War, and the 1973 Yom Kippur War. The Arad World was unsuccessful because of Amos 9:15. God has declared that the Jewish people would be brought back to their own homeland and no foreign entity would be able to uproot them again from their land. We know that Satan is at work today trying to raise up modern day world empires to try to destroy the Jewish people, but God has other plans for His chosen people, the apple of His eye. I am reminded of Deuteronomy 28 where God told Moses that the Jewish people would be scattered to the four corners of the earth. We know that was fulfilled in the year 70 AD when the Roman General Titus the son of Vespasian came into the city of Jerusalem and wiped out Herod's Temple and then scattering the Jewish people to the four corners of the earth. However, God promised that the Jewish people would be restored back in their own homeland. Exactly 1,897 years after the destruction of the Temple, the Jewish people are back in their own homeland because God keeps His promises. God keeps His covenants. I am reminded of Titus 1:2 where it says that, "In hope of eternal life in which God who can not lie promised before the world began." God made promises to the Jewish people and God will keep His promises to the apple of his eye. The Bible also tells us what the Jewish prophet Isaiah said. In Isaiah 66 it says, "Who hath heard such a thing, who hath seen such things? Shall the earth be made to bring forth in one day? Or shall a nation be born at once? For as soon as Zion travailed, as soon as Zion travailed she brought forth her children." Well, in just one day the nation of Israel was born — just as God revealed to the Jewish prophet Ezekiel and just as God revealed to the Jewish prophet Isaiah, that in one day the Jewish people would be back in their own homeland. And when was this? It was fulfilled on May the 14th of 1948. God also restored the Hebrew language as foretold to the Jewish prophet Zephaniah in Zephaniah 3:9, "For then will I turn to the people a pure language..." God raised up a man by the name of Eliezer Ben Yehuda and used him to restore the Hebrew language to the Jewish people. And, of course, Hebrew is the official language spoken in the State of Israel today. If the rabbis had their way, Hebrew would not be the official language of the State of Israel, but according to the New Yeshuv Zionist Movement, Hebrew is now the official language of the State of Israel. Why? Because the Jewish prophet Zephaniah foretold it in Zephaniah 3:9. To quote Israel's first Prime Minister David Ben Gurion concerning the rebirth of the Jewish State of Israel, "If you know the history of the modern story of Israel, if you know the story of Israel and what happened here and you do not believe in miracles, you are not realistic." If you don't believe that Israel is a modern day miracle of God as David Ben Gurion said, then it is you who are not being realistic. We see miracles concerning Israel throughout the entire Word of God, from Genesis 3:15 all the way to Revelation 22:20. Israel is indeed a modern day miracle of God. God said in one day that nation would be born. And, in Isaiah 66, in one day they would be restored back into the land, which happened on May 14, 1948, fulfilling Ezekiel 36:24. In Jeremiah 34, eighteen times he tells us there that God says that He will keep His promises to Israel. He will keep His promises to the Jewish people, and that is exactly what He has done. In the last part of our interview with August Rosado, we'll ask him if the Church will have to endure any part of the Tribulation. It is these promises fulfilled that reminds me of the ones yet to come and renews my spirit in an awesome God. I will bet you my soul that this will not happen. You are talking about stuff that you CAN NOT know. You might believe it, but you can not know that it is true or not. The hidden things belong to God, but all of the above - and more, He has chosen to reveal to us through the OT Prophets. My PC is kaput. last comment for a while. By the look of the poll and comments, it would appear a good number of people forwarded our latest e-newsletter on Misconceptions About the Afterlife to their unbelieving friends, yet they still don't believe. Bet your soul?! Mike, you must not believe you have one if you're willing to throw it away so recklessly. I can, too, be absolutely sure of what the Bible says concerning the future. When people read the Bible, they understand God's plan for salvation - Jesus Christ. When they accept Jesus as Savior and Lord of their lives, a radical transformation occurs in the way they live. That's proof enough for me that God is real and the Bible's His Word. Many other arguments can be made about why we should not bet against God.